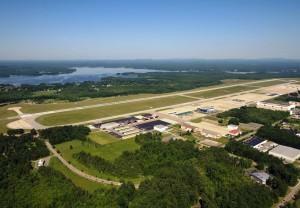 Pease International Tradeport is seen with Great Bay in the background. CLF says stormwater runoff from Pease has contaminated the Great Bay estuary with nitrogen, bacteria, heavy metals, petroleum products and likely toxic PFAS chemicals. Now, CLF and Pease have reached a settlement in U.S. District Court that will require the tradeport to get a federal municipal storm sewer permit. They'll have to clean up polluted runoff from new and existing development, and do more testing and cutting-edge treatment of PFAS chemicals in nearby surface waters. Those chemicals have also been found in Pease's drinking water. They're thought to have come from past military operations. The settlement will add to ongoing military efforts to study and clean up contamination at the tradeport, which has been a federal Superfund site since 1990. In a statement, CLF says the new settlement is the first of its kind to require a redeveloped base to get a federal sewer permit, or to mandate pilot treatment technologies for PFAS. Senator Jeanne Shaheen has announced that the Pease site will be the model test site for a national study examining the health effects of PFAS exposure. Andrea Amico has dealt first hand with PFAS contamination. Her two children were exposed to the chemicals at a Pease daycare. Tonight, she's one of several community members who will meet with the Agency for Toxic Substances and Disease Registry to learn about the study. The Sierra Club and the Conservation Law Foundation say they'll file suit under the Clean Water Act in January if things don't change at the power plant.